Aranea Ienith is a Dunmer elemental mage and a worshipper of Azura. She can be found praying at the Shrine of Azura and will task you with finding Nelacar, whom she says holds the power of the stars. According to Aranea, Azura led her people out of Vvardenfell to safety. If you choose to return Azura's Star to the shrine rather than give it to Nelacar, she will become a potential follower after completion of the quest. In addition, she can be recruited to join the Blades at Sky Haven Temple. If you cleanse it with the help of Nelacar, turning it into The Black Star, she will threaten to kill you for defiling a Daedric artifact. She is a very powerful mage wearing blue mage robes and boots when you meet her. She carries an iron dagger and a staff of frostbite. She knows a variety of spells as well. At the shrine, she can be heard chanting to Azura: "No harm shall come to me, for I live under Azura's wisdom. Her foresight protects me. Her insight sustains me. ", "We are children of the Twilight. Beings who are to be guided from the darkness into the light. And from the light into darkness. ", or "Azura. Who led her children away from the disaster of Vvardenfell. You are the prophet that reveals our true future." You may continue to hear this chanting during The Black Star, but not after you complete the quest. "'Seen my coming'? What do you mean?" "Azura has given me the gift of foresight. I had a vision of you walking up the steps to this altar long before you were born. You have been chosen to be her champion. I know it is unexpected, but do not worry. It will all unfold as she has predicted. "What is this place? Who's Azura?" "This shrine was built by the Dunmer. As our land was scorched by fire and brimstone, Azura's prophecies led us to safety. She is a Daedra, a powerful being who watches from beyond our mortal plane. She has chosen you to be her champion." "I don't believe in fate." "Perhaps that is what you are meant to believe. To better serve your role as Azura's champion. Do not fight it. Azura's prophecies always come to pass. To deny them is to go headlong into the darkness with no light to guide you." Whichever option you chose, you can still refuse to be anyone's champion, telling her to find someone else. She will concede: "There is no one else, but very well. I cannot force you to accept your destiny." If you agree to do Azura's bidding, Aranea will elaborate on a vision she received: "You must go to a fortress, endangered by water, yet untouched by it. Inside, you will find an elven mage who can turn the brightest star as black as night." She will go on to admit, "It is cryptic, I know, but Azura's signs are never wrong. I believe the fortress may refer to Winterhold. Ask if they know this elven enchanter." You can then follow up with more questions. If asked, Aranea will tell you more about Azura: "She is the Goddess of Dawn and Dusk. Azura sees into the Twilight of the future, and guides her followers through it." As for where the shrine came from, she will explain, "My people, the Dunmer, built it. We fled from Morrowind after Vvardenfell erupted almost 200 years ago. Those of us who were faithful to Azura were given a vision that led us away from the island before the worst came. This shrine is our thanks to her. That none will forget that she watches over us all." Should you ask her, she will also confirm that she is all alone at the shrine: "Yes. There were others at first, but Azura's visions tested everyone's faith. One by one, they left. Afraid to know their own future. But I refuse to abandon the shrine. The visions are a gift. Azura warns me of tragedy, war, death before it happens. I won't leave her guidance." When you part ways with her, she will tell you, "Twilight guide your path. ", "May Azura's magic protect you. ", or "This has all been foreseen, and we must play our parts." 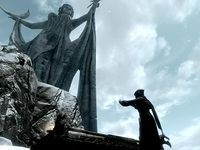 Greeting her again will have her say, "Azura is watching over you. She has seen this before it ever happened. ", "All will happen as it has been foretold. ", or "The Twilight has foreseen all of this. Everything will be revealed in time." 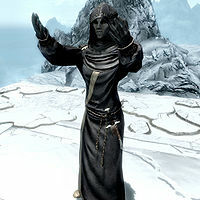 With further investigation in Winterhold, you will discover that the mage is an Altmer named Nelacar, who lives at the Frozen Hearth. After some persuasion, he will confess that he studied Azura's Star under a fellow mage, Malyn Varen. Malyn was later banished from the College of Winterhold for killing a student, and moved to Ilinalta's Deep to further his research on the Star. He will plead you to keep the Star from Azura, but whether you choose to do so or not, you have to retrieve the Star from Ilinalta's Deep. If you have not retrieved Azura's Star yet, you can still report your findings to Aranea, who will be encouraging: "Good. All will be revealed in time. Keep playing your part, and Azura will reward you." Once you have the broken Star, you can choose to bring it to Nelacar or to Aranea. When you talk to her, she will say, "Azura's Star! I knew the Lady of Twilight had sent you for a reason." She will continue, "Hand it over to me. I will ask Azura to restore the Star to its original purity." Should you request for more time to think about it, she will respond, "I understand. Speaking to a goddess is overwhelming for many. Return when you're prepared." and when you approach her again, she will ask, "Are you ready for me to show Azura her Star and receive her wisdom?" Letting her take it will have her say, "I will commune with Azura." as she takes the Star, placing it on the altar. She will pray, "Azura. Mother of Roses. Goddess of Dusk and Dawn. Your chosen champion has returned your Star to you." and then address you: "She wishes to speak to you herself. Please. Place your hands on the altar, and you will hear her voice." She will walk away from the altar, and if talked to, she will repeat, "Please place your hands on the altar. Azura wishes to speak with you." From the planes of Oblivion, Azura will tell you that her Star is useless for now, as it is occupied by Malyn Varen's soul. She will offer to send you to the Star's realm, so you can dispatch Malyn and claim the Star as yours. Once you have done so, you will be returned to Skyrim, and Aranea will return to pray at the altar. If you approach her, you will see that she is filled with loss: "While you were in the Star, Azura gave me a vision. Her last, she said. I have never been without Azura's foresight since escaping Morrowind. I don't know what to do." She will come up with an idea: "If you need me, I'd be honored to accompany you, Guardian of the Star. It would give me a purpose." If you express your thanks, she will warmly wish you, "Twilight watch over you, guardian." If you instead ask of her usefulness, she will respond, "I was a sorceress of no small skill before I came into Azura's faith. Afterwards, her magic sustained me. I could easily provide my spells to your cause. Protect you from harm. Defeat your enemies." Either way, she is now available as your follower. If asked, she will tell you that Azura isn't giving her more visions: "No. She said my part was over. That my fate had moved beyond the Twilight, and I was on my own. I will tend Azura's shrine when you do not need me. I still have my duties, but for the first time I feel... alone." She will bid you farewell with the words "Until next time, guardian." or "It's been an honor, guardian." Her greetings are similar: "The Twilight watches us all, guardian. ", "Yes, champion of Azura? ", or "What do you need, guardian?" Alternatively, you can return Azura's Star to Nelacar, turning it into the Black Star. Should you choose this option, attempting to speak to Aranea will only have her warn, "Leave this shrine, blasphemer, before I kill you for defiling Azura's artifact." She cannot be engaged with, but despite what she claims, she will not turn hostile if you linger around the place. This page was last modified on 7 October 2018, at 18:39.